Hello. 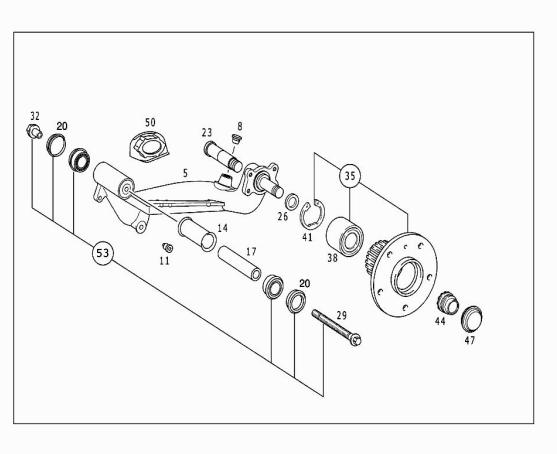 I recently had my rear axles arms replaced with new one (number 5 in the picture). After inspecting the old one I found out that the mechanic didn't use the spacers that sit between the bearing and arm (number 26 in the picture). I asked him and he said that the new ones had new spacers but that's not true, there were no spacers in the new arms. I told him and he said that if so then the shoulder was already bigger in the new ones, I compared pics of the new ones with the old ones and that's not true either. So basically the truth is he didn't put the spacers and he doesn't want to solve the situation. My question is, what can happen without this spacer? My guess is that the bearing is now only stopped on the outer side of the ring and there's an empty space in the inner side. Can this lead to bearing breaking?